"How subjects move or do not move tells us much about what counts as human, as culture and as knowledge." Hieroglyph is a visual study of the mystery, history, and contemporary employment of signs and symbols within the storage and interface of information. 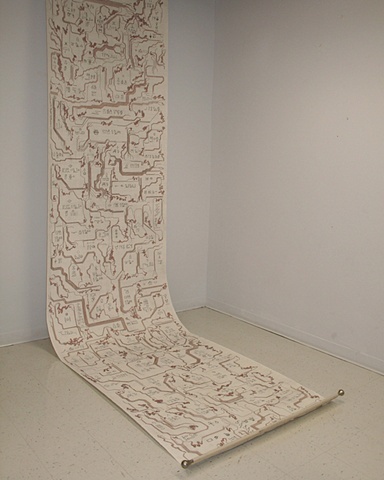 This work takes the form of an ancient scroll whose surface is inscribed as a silicone circuit board. The face of incomplete circuit boards are covered with symbols that serve the purpose of communicating to electronic workers where to attach specific circuit components. With an interest in bridging ancient and contemporary use of pictorial symbols, the artist took images from circuit boards and computer software, described their function in simple English terms, entered that description into a hieroglyph translation program and finally inscribed the electronic symbol along with its corresponding Egyptian hieroglyph in pairs on the scroll.